Although it’s been only a little over a year ago when the stock site was introduced, Adobe Stock already shows one of the widest varieties of images available in the stock media market. After its acquisition of Fotolia which they kept as a separate stock agency, Adobe introduced Adobe Stock which is integrated with its existing software subscriptions. The new stock site has over 40 million files from Fotolia contributors and a more attractive website built into Creative Cloud. What are the content offered in Adobe Stock? Photos. Currently, the stock site has millions of high quality images waiting to be discovered. It also features a premium collection of photos from selected contributors. These include images from featured contributors, images that tell a story, and those chosen by editors. If you are looking for the perfect photos to create your next creative project, you can find it here. Videos. Adobe Stock started with images only, but later on it added videos in its offering – which is a logical step. Individuals and corporations make use of both images and videos to enhance the quality of their products and websites now. Adding videos to their library widens their client base. Finding the perfect images and videos at Adobe Stock is not a problem. The stock site has a well-organized and highly functional library. You can sort images by popularity, relevance, most recently added, and the new “undiscovered” option, which displays images that have not been used before. Although Adobe Stock is a new member of the stock media industry, you can read a good review here, it does not disappoint the creative community. It has one of the largest stock libraries and the most innovative tools today. Plus, its integration with Creative Cloud software is a unique feature that helps save time and money. Many individuals and businesses would surely want an opportunity to work with watermarked images and present their design for client’s approval before they make a purchase. Are you looking for high quality stock images for your creative projects? There is a new player in town. Adobe Stock has been in the industry for a little over a year only, but it has shown great potential. It started with over 40 million images from Fotolia and the Dollar Photo Club, and started accepting contributions from global photographers. The stock site is integrated with Adobe Creative Cloud desktop applications, making it a great choice for Creative Cloud users. You can buy a single image at less than $10 or subscribe to a plan with 10 images per month. You can also opt for larger subscriptions to meet your larger creative needs. Adobe Stock offers 350 and 750 images per month, with additional Adobe Stock images at $0.99 each. Adobe Stock has one of the largest libraries in the market. You will have more choices available to jumpstart or complete your creative projects. The website is accessible. Wherever part of the world you may be, you can access the stock site. It is available in most countries at 20 languages. The stock site offers simple pricing. You can purchase Adobe Stock images a la carte at $9.99 each, or subscribe to a plan that meets your creative needs starting at $29.99 per month. It is integrated with Creative Cloud desktop applications. You can design comp images and submit them for client approval before actually purchasing them, saving you more time and money from reworks. Adobe Stock is a standalone website. Are you using a different editing software? No problem. You can still download images from the stock site. Instead of searching inside the Adobe software, you just have to find the images in the standalone website. Premium Adobe Stock images are also now available at the website. You can choose images from Editor’s Choice, Concept Collection, Featured Contributors and other select inspiring artists. Whatever you need, you will surely find it at the stock site’s vast library. Adobe Stock is Adobe’s newest product offering. It is completely integrated into their 2015 Creative Cloud service. They offer over 40 million high-quality, curated images integrated directly into the digital media giant’s most respected programs such as Photoshop. As a standalone service, Adobe’s stock images it offer exceptional value. Adobe has succeeded that where other stock photo imaging services have failed. While most other stock photo services cater to the marketer, Adobe has catered to the creative professional – with good reason. Most of Adobe’s customers are not marketers. They are graphic designers. They are movie editors. They are creative professionals. Adobe takes it one step further by offering a 40% discount on their Adobe Stock service for those who have signed up for their Creative Cloud service. Creative Cloud is proving to be an excellent business move for Adobe. They’ve integrated their best applications, from Dreamweaver to Photoshop to AfterEffects and Muse, into their own cloud offering. They made more affordable as well. Photoshop is a program that has set people back over thousand dollars in the past. That’s not the case anymore. Now, if you want to use Photoshop, you can pay them much more affordable monthly fee – as low as $19.99 per month. That puts Photoshop in everyone’s reach. Here’s the kicker. Previously, with Photoshop (or any other app, for that matter) you needed supply your own photos. Many people have relied on third-party stock photo imaging sites for high-quality photos. They don’t need to do that anymore. Adobe’s Creative Cloud customers are eligible for a huge discount – up to 40% – if they add Adobe Stock to their subscription. What costs others $49.99 per month for ten images (additional images $4.99) will cost Creative Cloud customers $29.99 per month with each additional image costing $2.99. 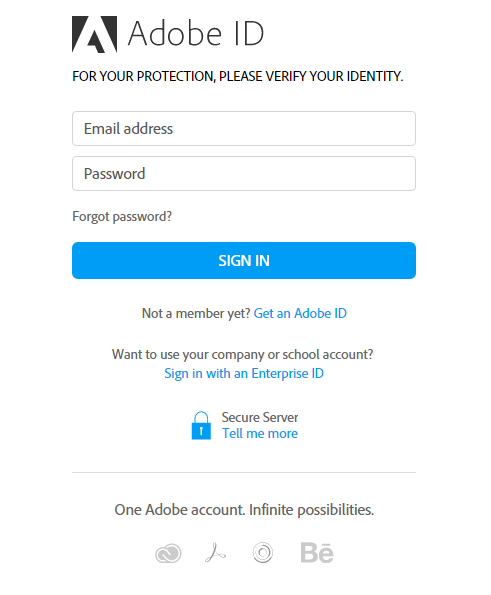 All you need to do to sign up is have an Adobe ID. They asked for your first name, your last name, your email address and a password. They also ask for your country of residence, so they know which of the Adobe sites (they are global company with several sites in different languages) you plan on subscribing to. Once you’ve logged in for the first time, you can create your subscription plan. Review your membership details and make sure you click on the little checkmark box to include Adobe Stock to take advantage of the discounted price. As you go along, you will include your payment information in your account will have been created. Carefully enter the correct email address, as it does not ask you to confirm it before asking you for your payment details. Once you’re done, you can enjoy everything Adobe has to offer!